If your heating system shuts off and you don't know why, don't call an ambulance when an aspirin will do. Follow these steps to save yourself a service call. Check the heating system switches. (they're red with one probably located in the closet or stair well, the other near the heating unit.) Are they on? Check the oil tank. Is there fuel left? Check the thermostat. Is it set above room temperature or to "heat?" Check the fuses or circuit breaker assigned to your heating system. Did you trip it? If nothing else is wrong in steps 1-4 press the reset button on the burner relay once only (see the picture below). If you don't know where it's located, call us. If the unit comes on and stays on, you're probably okay. If it comes on for about 90 seconds and then quits, or if it doesn't go on at all, call us. It's best to let the service technician handle the "surgery." For more heating system tips or questions call us or visit the Maine Energy Marketers Association (formerly Maine Oil Dealers Association) at www.maineenergymarketers.com. DO NOT operate a light switch, telephone, cigarette lighter, appliance or thermostat. Any spark in the area where propane gas is present may ignite the gas. Call 911 and AE Robinson - Use your neighbor’s telephone if gas odor is in the building. Have your AE Robinson service person locate and repair the leak. 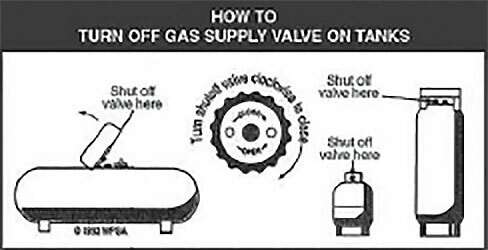 Have your service person air out the area and check and re-light your gas appliances. Do not return to the building until you are advised that all leaks have been repaired and it is safe to return. For your safety, propane has an odor added so you can detect leaks. You and each person using or handling propane in your household must know the smell of propane. Ask for a scratch & sniff brochure or MSDS to demonstrate the odor. If anyone is unable to recognize the odor of propane, call us immediately. Propane vapors are heavier than air, spread rapidly, and migrate in all directions. To check for propane, carefully smell in low spots. Under some of the following conditions, you may not be able to smell a gas leak: Age, colds, allergies, sinus congestion or the use of tobacco, alcohol or drugs may diminish your sense of smell. In certain circumstances, propane gas may lose its distinctive smell - this is called “ODORANT FADE”. Some persons are physically unable to detect the smell of gas. If you are one of these people call us immediately. For these reasons, it is recommended that you purchase and install a propane gas detector according to the manufacturer’s instructions as a back-up warning device. If anyone using or handling propane is unable to recognize the odor of propane, you should not use it until you have purchased and installed gas detectors. For more propane tips or questions call us or visit the Propane Gas Association of New England at www.pgane.org.